The Manitoba Research Alliance has two exciting fall events! Please join us – RSVP info is below. 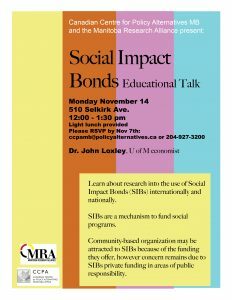 November 14 from 12-1:30, 510 Selkirk Avenue – Social Impact Bonds (SIBs) are a mechanism to fund social programs. Come hear Dr. John Loxley discuss the use of SIBs both nationally and internationally. While community-based organizations may be attracted to SIBs because of the funding they offer, concern remains due to SIBs private funding in areas of public responsibility. Please RSVP to ccpamb@policyalternatives.ca or 204-927-3200. December 13, Thunderbird House – State of the Inner City Report 2016. 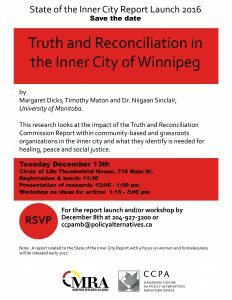 Truth and Reconciliation in the Inner City of Winnipeg by Dr. Niigaan Sinclair, Timothy Maton and Margaret Dicks. This research looks at the impact of the Truth and Reconciliation Report within community-based and grassroots organizations in the inner city and what they identify is needed for peace, healing and social justice. Workshop on ideas for action: 1:15-3:00pm. Please RSVP to ccpamb@policyalternatives.ca or 204-927-3200, and take note that the presentation and workshop should be RSVP’d to separately. Light lunches are included for both events.